Millennials are getting beat up these days for their money habits. According to observers, people between the ages of 18 and 34 are financially irresponsible — one CEO even suggested they are spending too much money on pricey avocados when they should be saving for a home. Should we take it easy on millennials when it comes to their money habits? Perhaps, and here's why. We encourage young people to attend college, but according to Student Loan Hero, the average member of the class of 2016 graduated with more than $37,000 in student loan debt. Borrowers between the age of 20 and 30 spend an average of more than $350 a month to pay off these loans. One of the biggest problems with the current economy is that it's been a long time since wages have gone up in real terms. In fact, there's evidence that wage growth has basically been stagnant since the 1970s, and any wage growth at all has been concentrated to the top earners. Anyone without a college degree has seen their wages decline, on average, in the last decade. 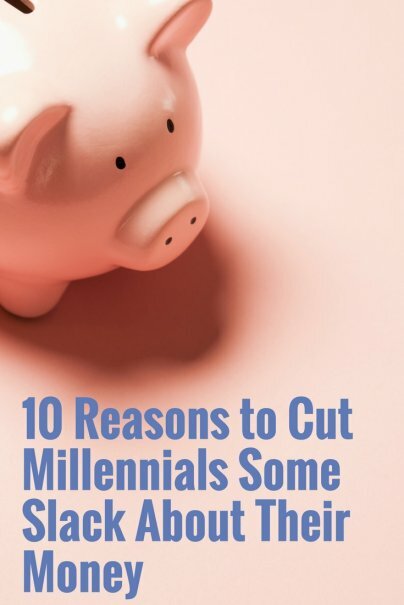 It's easy to accuse millennials of making bad financial choices, but there's very little evidence they are rolling in the dough to begin with. In many parts of the country — especially those with good job opportunities for millennials — it's nearly impossible to find an affordable house or apartment. A recent survey of 24,000 renters by ApartmentList.com found that millennials would have to wait more than a decade to save enough for a 20 percent down payment on a home in many markets. In some cities, including San Francisco and Austin, the wait is as much as 19 years. There are simply not enough affordable, entry-level homes available for millennials to buy, and with interest rates rising, the problem is only going to get worse. If you're a baby boomer or even a GenXer, you might have worked for a company that offered generous pensions to its employees. For much of the 20th century, workers could find decent jobs at big companies and know they'd be getting a monthly check even after retirement. For millennials, the stock market and economy have done quite well during their time on Earth, but there were several big events that may have left them wary about investing. It's easy to say that millennials should be more frugal, but that's easier said than done when America's marketing dollars are bombarding that exact generation. Ask any advertiser what their coveted demographic is, and they'll likely tell you they deliberately target people between the ages of 18 and 34. On one hand, we want young people to be responsible with their money. On the other, we know that consumer spending by that same group is often a big driver of the American economy. It may be frustrating to see millennials with poor personal finance skills. But while they may not necessarily be smart with money, they are not as selfish as you might believe. Millennials basically invented the concept of crowdfunding, which has led to sites such as GoFundMe and others that have supported nonprofits. One survey from 2014 noted that 84 percent of millennials donated to a charity that year, and that they are more likely to give on their own accord rather than from a top-down, corporate-driven approach. People who grew up during the Great Depression learned the hard way about living frugally and making every penny stretch. Those who grew up during World War II remember making severe sacrifices. Even baby boomers remember the gas shortages and economic stagnancy of the 1970s. By contrast, millennials have grown up in a time of relative prosperity. Millennials have never been forced to learn how to save and invest as a matter of survival. Is it their fault that they grew up in relative comfort compared to older generations? Older people like to accuse younger generations of spending money needlessly, but think of the expenses they have that did not exist even 20 years ago. Cellphones? Tough to get by without one these days. High-speed internet service? Yeah, that's almost as important as electricity. Millennials have considerable expenses each month that were once considered luxury items, but are now considered vital.